I am absolutely thrilled to have received these awards! I have loved creating this site. It means so much to me that these kind people have honored my site with their award. Please visit their site by clicking onto the award. You will have fun visiting them. They have great sites! 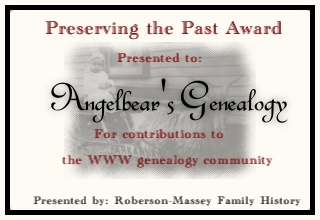 For your Preserving the Past Award! 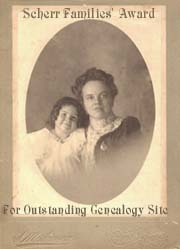 Surnames: BROWN, BURRIS, CAMPBELL, CARRIER, DAY, FOLEY, HARRIS, LAMB, MASSEY, MAYBERRY, MIDDLEBROOKS, NEEL, PADGETT, PAUL, ROBERSON, SCHWARTZ, SPRINGER, TRAIL, VERMILLION. I love the award you made just for me! 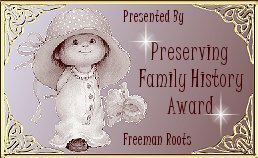 For your Preserving Family History Award! 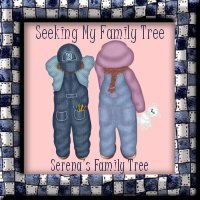 For your Seeking My Family Tree Award! 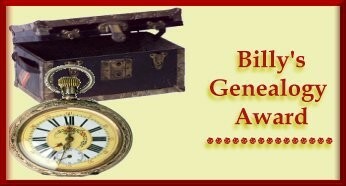 For your Billy's Genealogy Award! For your Scherr Families' Award! Thank you so much for your Eby Award! Atkins, Canada, Carpenter, Clark, Clarke, Close, Crocker, Daniel, Daunet, Dean, Flint, Franks, Freeman, French, Hadley, Harper, Hayes, James, Johnson, Jones, Judkins, Gambrill, Lindley, Miller, Moorman, Nipper, Pace, Parke, Payne, Pickering, Ridenhour, Taliaferro, Tatum, Todd, Turner, Warren, Wetmore, Whisenhunt, Wilson, Woodin, Yancey. 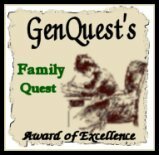 Thank you so much for your GenQuest's Award of Excellence! Adams, Appleton, Baker, Bloomer, Blair, Butler, Charles, Collins, Cross, Dennis, DePauw, Doyle, Hodgson, Hogarth, Lane, LeMaster, McCoy, Mockler, Neil, Payne, Rahill, Seeley, Shue, Terrell, Usrey, Van Parys.